Getting sales on social media is like making a cake. Without the proper ingredients, you won’t have a cake – or in this case a sale. Thankfully, social media has the power to create all those important ingredients as long as you know how to use it correctly. If you don’t know the recipe, it’s quite simple, but we’ll go more into detail later on in this article. However, the two key ingredients are trust and credibility. If nobody trust you, and you come off as not trustworthy on social media, there’s a big chance you are scaring away all potential customers. In this article, we’ll be teaching you How To Post on Social Media to Make Sales by getting more interest and exposure when it comes to your product service or business. If you’re reading this, you probably have a great product or business that you know can help people, you just need a way for people to listen and take action on what it is you’re offering. First off, it’s important to know the difference between curiosity and resistance. Typically when we’re taught how to promote our business on social media, we create a lot of resistance because what we do on social media is selling. Social media is not actually the place we sell. It’s the place where we increase curiosity, and most importantly, get all the ingredients needed for the recipe of a sale. The key to a sale on social media is peaking the curiosity of someone, and making them want to learn more about you. And when you’ve done that, you’ll make a sale. As mentioned, social media is not a place to make sales, it’s a place to peak interest. By sharing stories, people are going to identify with them and want to learn more, than just writing “Hey, buy my stuff”. If your strategy is to write “Hey, buy my stuff”, you’ve probably already realized that it doesn’t work and know that you need to change strategy. It’s not recommended that when sharing a post on social media, you include a link back to your store. Because if you post a link directly to your store, it becomes really promotional, and then people don’t take action. In fact, a lot of people will feel like they’re just being sold something. If you’re going to leave a link, leave a link to your capture form where you can get people into your funnel. Instead you, instead of leaving a link to your store directly say something like “if you want to learn more about this, send me a message”, and you can explain more and get them more engaged with your brand. The great thing by doing this is that you’ll get so much more people reaching out to you, you’re going to learn who those people are, and you’ll be able to follow the whole marketing process. 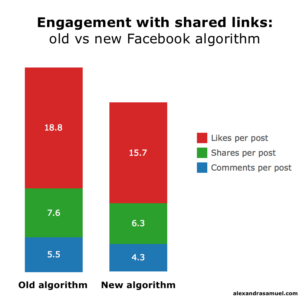 If you’re doing marketing on Facebook, you may or may not know that by posting external links in a Facebook post, that post will generate much worse results than if you were to upload the content directly to Facebook. The reason to this is that Facebook doesn’t want their users to leave their platform, and therefore limits the reach of your post including a link to an external source. In other words, by posting a link to an external source, the reach of that post will be limited, and you want as many people to see your posts as possible because only then is it able to sell your products to them. This should be a rule that every brand on social media follows, unfortunately though, that is not the case. When you provide value on social media, you are going to create an interest and soon become the go-to source for whatever it is you’re sharing. There is something for every brand to do in terms of providing value, you just need to get to know your target audience to learn what it is they want. For example, if you’re a beauty company, creating makeup tutorials provides a lot of value to those who would like to learn how to put on their makeup and what products to use. However, be careful. If you were to create those types of videos, don’t start talking about how good your products are because they know who the words are coming from. Instead, focus on making killer makeup and people will ask you what kind of makeup you were using because they want to get the results you get. Show results and people will want to learn how to get those results. That’s when you let them know about your product. And the same principle goes for all business, not just makeup companies. Provide value, peak interest, present your service/products. Instead of getting your audience to write to you, you can also get in touch with your audience. To do so, you need to identify and find your target audience. Once you’ve found your audience, it’s time for you to start engaging. As you’ve probably learned by now, you can’t just approach them saying “Hey, buy my stuff” because that will never work. The same principle goes for this. You need to peak interest and provide value. The value of a product or service is most often a problem you’re solving. Therefore, writing things like “I see you have this problem, maybe this product can help” is a much better approach. By doing so, you show that you care about them and their problem and want to help them instead of just get their money. Plus, showing that you know about their problem just tells them that you have experienced the same one, meaning they’ll trust you more easily in this matter. When it comes to driving sales on social media, there are some key ingredients that you must have in order to finally drive a sale. To do so, you must sure you are always providing value in front of getting value by promoting. If you provide value, you’ll get more interest than if you promote. Secondly, you want to peak an interest with your social media posts, so your audience will be curious in learning more. When they want to learn more, you lead them to your sales funnel but never directly to your website. Lastly, make sure you engage with your audience on a personal level. This builds trust, and if your audience doesn’t trust you, they’ll never buy from you.